The TT3000 is a very powerful light that is ideal for the helmet, but can be mounted on the bars too (click to enlarge). For this season, the runtime has been improved to 2:25 and the price has been lowered to $299. Given the incredibly light and bright head unit already on this light, these are very welcome changes indeed. CandlePower Tech is a group of craftsmen that strive to build some of the brightest and smallest lights around. They believe in very bright helmet lights that have a very big and even beam pattern. With a 100 gram light head with 8 LEDs, the TT3000 is a very powerful little device that is ideal for the helmet but can be mounted on the bars too. The battery is 265 grams so it may need to go on a backpack or jersey pocket. Made entirely in the U.S. The light heads are very smart to use the universal GoPro compatible mount, thus it is ready for an array of helmets with built-in mounts. 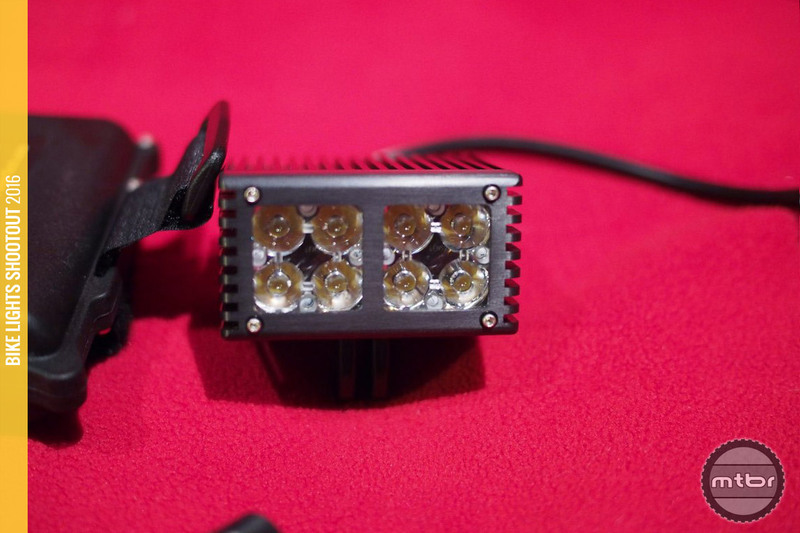 And the plethora of GoPro or third party mounts can be used with this light. Construction is first rate on these lights so expect these systems to last a very long time. 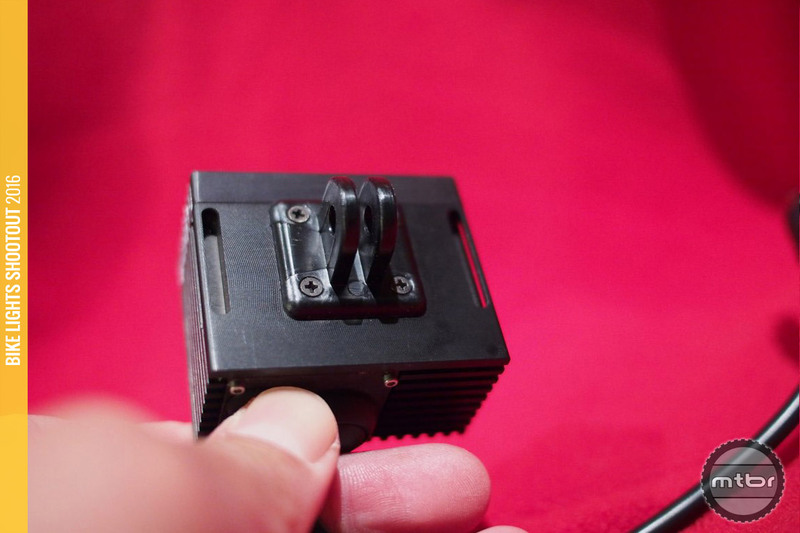 The light uses a standard GoPro mount so it is instantly compatible with a host of mounts, including helmets with this interface (click to enlarge). At the end of the day, it’s really all about the beam pattern, and the CandlePower Tech TrailTorch TT3000 delivers with a wide, long beam that is very even. There’s no hotspots or artifacts in the pattern. It’s clean and the throw is excellent. At high speed, this light really delivers as you can see a long way, yet the periphery is lit up as well. The beam pattern is more rectangular rather than round and that’s a good thing. That means the optics have been designed to point the light at the trail to make use of all this available light. I’ve been running the older model TT2200 for a couple of years. The quality and volume of light is confidence-inspiring for gnarly night-rides, and it’s held up well after a few seasons of heavy use in the wet, muddy PacNW. Customer service is also fantastic — these are people you want to do business with. N/A lumens? Did the light die? I’m a return buyer to this company. I had purchased their TT1800 a few years back and found that it fit the build for a high end light with quality output, meticulous build at a fairly reasonable price.. Recently, I purchases this light, the TT3000, and found it to be orders of magnitude better than the TT1800 in all respects even though the 1800 is a killer light for night riding. While I can’t authenticate the actual lumens, the beam pattern and throw is fantastic and a quantum leap above the1800. Strapped to my helmet, I can’t outrun the beam and the squared off pattern gives a very deep throw and a very even broad pattern that pushes back the darkness better than any lights I’ve seen. The battery packs are bullet proof, and I carry a backup in my camelback. Run times, at 40 degrees have exceeded an hour and a half without discharging the battery or it dropping down in brightness. Cabling is literally a snap and is uber high end. FYI, per their store, they are sold out until Fall 2016.